Astronomers using the Atacama Large Millimeter/submillimeter Array (ALMA) are making high-precision measurements of Pluto’s location and orbit around the Sun to help NASAs New Horizons spacecraft accurately home in on its target when it nears Pluto and its five known moons in July 2015. Though observed for decades with ever-larger optical telescopes on Earth and in space, astronomers are still working out Pluto’s exact position and path around our Solar System. This lingering uncertainty is due to Pluto’s extreme distance from the Sun (approximately 40 times farther out than the Earth) and the fact that we have been studying it for only about one-third of its orbit. Pluto was discovered in 1930 and takes 248 years to complete one revolution around the Sun. With these limited observational data, our knowledge of Plutos position could be wrong by several thousand kilometers, which compromises our ability to calculate efficient targeting maneuvers for the New Horizons spacecraft, said New Horizons Project Scientist Hal Weaver, from the Johns Hopkins University Applied Physics Laboratory in Laurel, Maryland. The New Horizons team made use of the ALMA positioning data, together with newly analyzed visible light measurements stretching back to Pluto’s discovery, to determine how to perform the first such scheduled course correction for targeting, known as a Trajectory Correction Maneuver (TCM), in July. This maneuver helped ensure that New Horizons uses the minimum fuel to reach Pluto, saving as much as possible for a potential extended mission to explore Kuiper Belt objects after the Pluto system flyby is complete. To prepare for this first TCM, astronomers needed to pinpoint Pluto’s position using the most distant and most stable reference points possible. Finding such a reference point to accurately calculate trajectories of such small objects at such vast distances is incredibly challenging. Normally, stars at great distances are used by optical telescopes for astrometry (the positioning of things on the sky) since they change position only slightly over many years. For New Horizons, however, even more precise measurements were necessary to ensure its encounter with Pluto would be as on-target as possible. 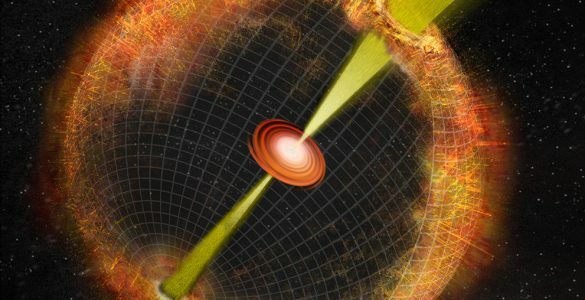 The most distant and most apparently stable objects in the Universe are quasars, galaxies more than 10 billion light-years away. 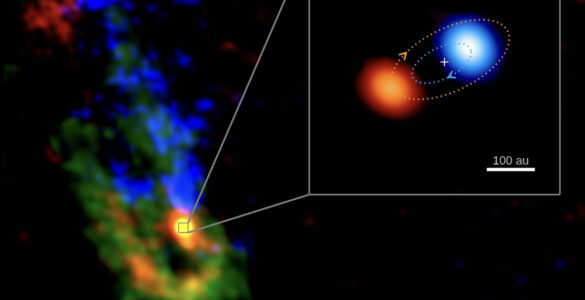 Though quasars appear very dim to optical telescopes, they are incredibly bright at radio wavelengths, particularly the millimeter wavelengths that ALMA can see. 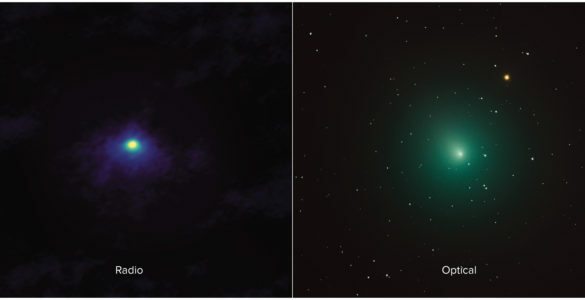 The ALMA astrometry used a bright quasar named J1911-2006 with the goal to cut in half the uncertainty of Pluto’s position, said Ed Fomalont, an astronomer with the National Radio Astronomy Observatory in Charlottesville, Virginia, and currently assigned to ALMAs Operations Support Facility in Chile. 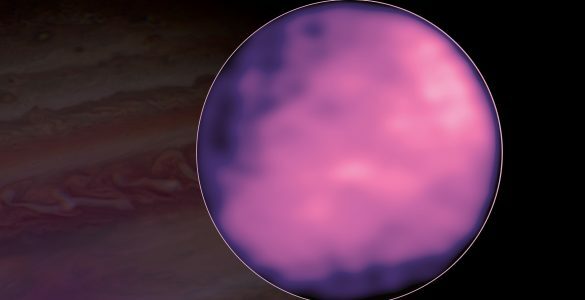 ALMA was able to study Pluto and its largest moon Charon by picking up the radio emission from their cold surfaces, which are about 43 degrees Kelvin (-230 degrees Celsius). The team first observed these two icy worlds in November 2013, and then three more times in 2014 — once in April and twice in July. Additional observations are scheduled for October 2014. 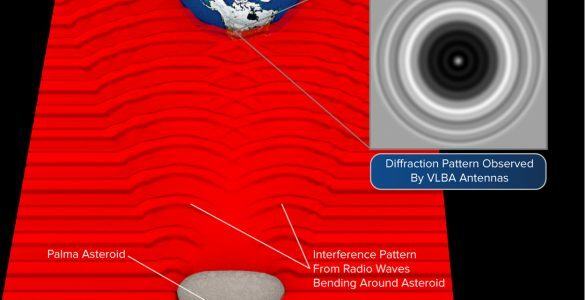 “By taking multiple observations at different dates, we allow Earth to move along its orbit, offering different vantage points in relation to the Sun,” said Fomalont. “Astronomers can then better determine Pluto’s distance and orbit.” This astronomical technique is called measuring Pluto’s parallax. ALMA, an international astronomy facility, is a partnership of Europe, North America and East Asia in cooperation with the Republic of Chile. 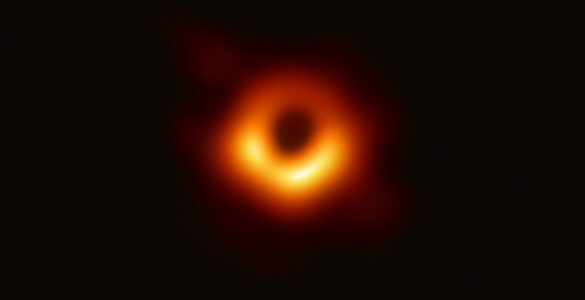 ALMA construction and operations are led on behalf of Europe by the European Southern Observatory (ESO), on behalf of North America by the National Radio Astronomy Observatory (NRAO), and on behalf of East Asia by the National Astronomical Observatory of Japan (NAOJ). The Joint ALMA Observatory (JAO) provides the unified leadership and management of the construction, commissioning and operation of ALMA. New Horizons is the first mission to the Pluto system and the Kuiper Belt of rocky, icy objects beyond. 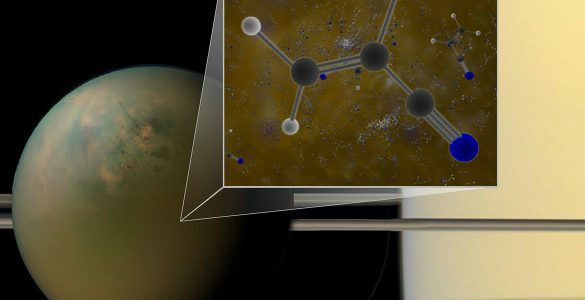 The Johns Hopkins University Applied Physics Laboratory (APL) manages the mission for NASAs Science Mission Directorate; Alan Stern, of the Southwest Research Institute (SwRI), is the principal investigator and leads the mission. SwRI leads the science team, payload operations and encounter science planning; APL designed, built and operates the New Horizons spacecraft. New Horizons is part of the New Frontiers Program managed by NASA’s Marshall Space Flight Center in Huntsville, Ala. For more information, visit http://pluto.jhuapl.edu. 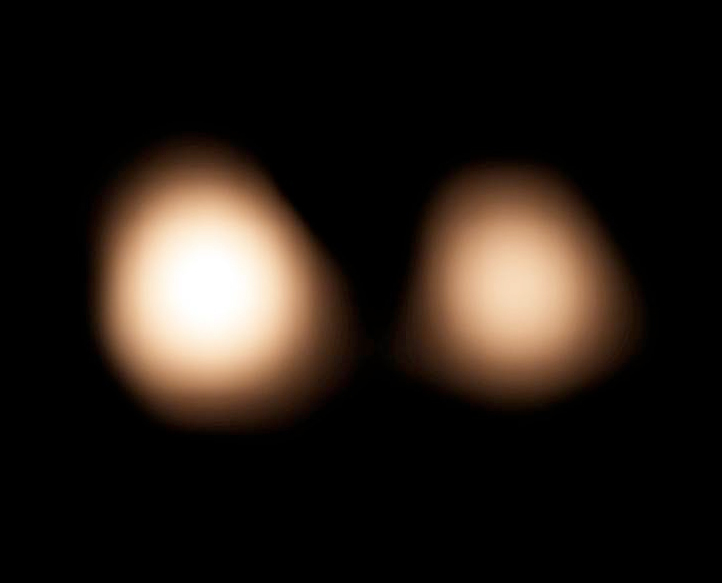 The cold surface of Pluto and its largest moon Charon as seen with ALMA on July 15, 2014. Animated image of ALMA data showing the motion of the moon Charon around the icy dwarf planet Pluto.